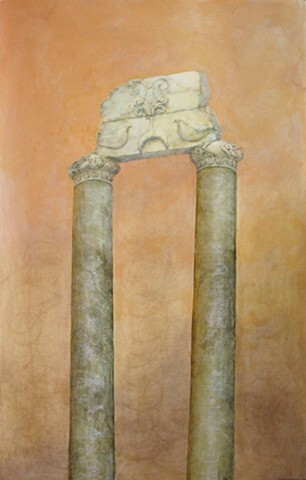 Part of a series exploring columns, remnants thereof, and the surrounding atmosphere. They are painted in oil, often on Arches oil paper, a special paper that is sized to receive oil paint directly, without a barrier. The effect when working is very tactile and works so well with the atmospheric quality of this series. I can rub in dozens of transparent layers of color to produce the richness and subtle variations in stone and air.